Halimat T. Somotan is a fifth year doctoral candidate in the African History program. Her research interests are in urban, medical, newspaper, and nineteenth/twentieth century Nigerian history. Her masters’ thesis explored how advertisements of patent medicine or cure-all medicine in colonial Lagos newspapers shaped new meanings of health. She is concluding fieldwork in Nigeria and the United Kingdom on her dissertation, which investigates the struggles to define national belonging through the processes of making and unmaking Lagos as the capital city from 1954, when the colonial government and Nigerian politicians declared Lagos as the federal capital of the Nigerian federation, to 1976, when the military government decided to shift the capital city to Abuja in Northern Nigeria. She uses photographs, novels, musical recordings, newspapers, administrative papers, and oral interviews to understand contestations over space as well as meanings of political belonging in the everyday experiences and administration of the city. Halimat has served as a teaching assistant for courses such as Introduction to African History, Modern Caribbean, and West African History. She participated in the Teagle Summer Institute and worked as a Peer Teaching Consultant Fellow (2015-2016) with the GSAS Teaching Center. She recently worked with Dr. Yuusuf Caruso, the African Studies Librarian, to catalog photographs on African countries during the 1960s by Marc and Evelyne Bernheim from September 2015 to December 2016. She was a Co-representative for Students of Color in the Graduate History Association from Fall 2015 to Spring 2016. She is a member of the Conference, Workshop, and Seminar Committee of the Lagos Studies Association. In 2012, she received her B.A in History and Theatre Arts from Fairfield University, where she was awarded the Ella Baker Award for Excellence in Black Studies. During her undergraduate studies, Halimat spent a semester studying Kiswahili and East African History at the University of Dar es Salaam, Tanzania. 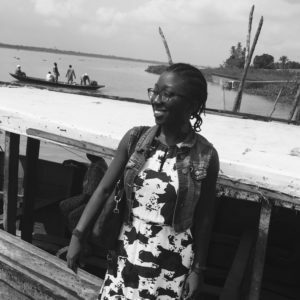 Born and raised in Ibadan, Nigeria, she enjoys traveling, visiting museums, reading fiction, and listening to juju music.